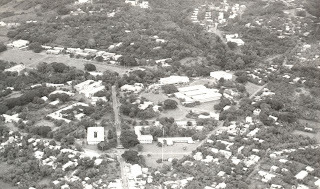 For the old hand at UPLB, this aerial view of Grove (foreground) and the UPLB campus is definitely recognizable. Of course, it's much more congested now, and quite a few commercial houses have replaced old landmarks like the Kitchenette, Quality Store, Carangal Store, and Hongkong restaurant. This used to be the Department of Entomology building, but today is the College of Human Ecology (which used to be the Department of Human Technology). 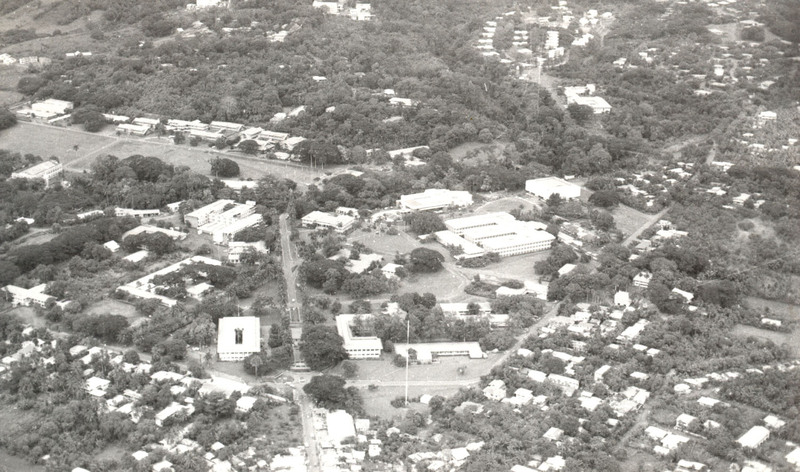 For the nostalgic, this pix is a very high angle view (the photographer must be way above the old Agronomy building) of the portion of the UPLB Campus showing Mt. Makiling in the background. 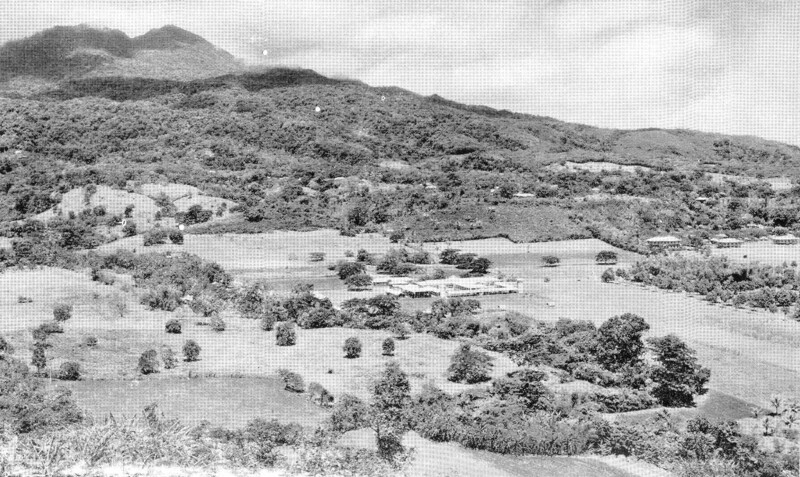 This was how the place looked like prior to the construction of the new UPCA buildings in the mid-1960s. 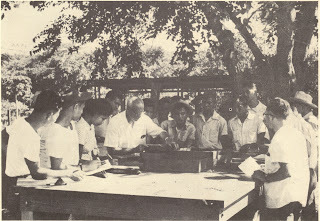 Even in those days, they used to hold classes under the shade of a tree. 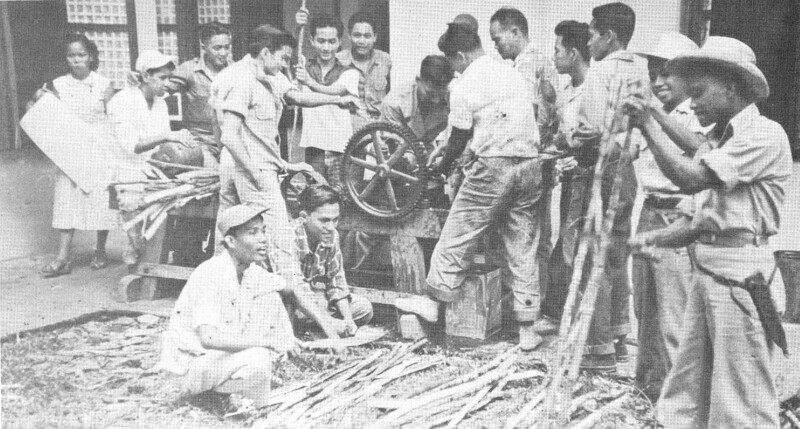 Here, a professor demonstrates to horticulture students how to construct a sedbed. In my first semester at UPCA, our class in Elementary Sociology met under the shade of a kaimito tree beside the then Dept. of Agricultural Education Bldg, which used to be where the CDC stands today. 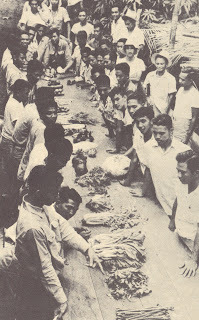 Looks like boodle fight? Not really. When I was Freshman (uh, um, in the early 60s) taking up horticulture subject, this was how we took our practical exams in our laboratory classes. 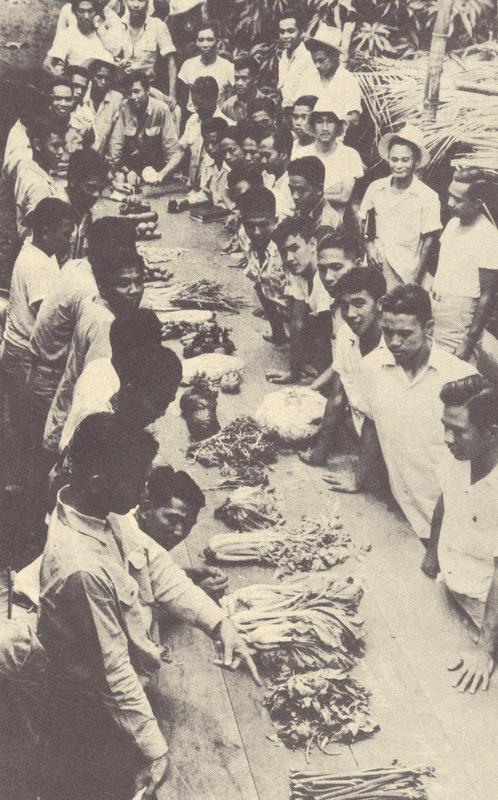 Students position themselves in front of one kind of crop of vegetable, writes the name of the vegetable in his quiz paper (common -- English -- name and scientific name), and waits for the signal to move to the next specimen. We had one minute for each crop/plant. This first time I took this practical exam, I knew none of the crops because these were not grown where I came from. But I knew all of them by semester's end. This is currently the DCMT (used to be DMST), but this building used to be the UPCA Infirmary. This bldg is near the Baker Hall, across from the parade ground. UPCA Hotel? Well, this was the Faculty Cottage bldg., where faculty members lived in the olden days. 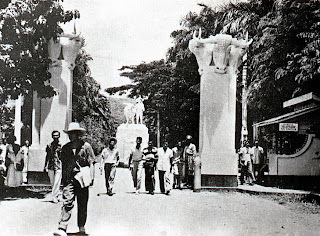 This, of course, is the most popular and important landmark on the old UPCA Campus, the UPCA Gate, very distinct because of the carabao heads and the carabao and farmer statue behind. In our time, there were only five passenger jeepneys plying the route between the UCPA campus and Bayan. The passenger fee then was P0.10, but we preferred to walk even down to Crossing because sayang naman ang ten centavos. Today, students, interestingly, are back to walking. Must be due to the wellness movement going on among faculty and students of UPLB. Current traffic rule prohibiting passenger jeepneys from plying streets in the middle of the campus has made UPLB a pedestrian campus, which isn't a new idea. Brisk walking from classroom to classroom across campus used to be a required task for all UPCA students. The PhySci Bldg under construction in the mid-60s. This was the site where the building housing plant breeding and the Office of the College Secretary of UPCA used to stand. At the back of the old building was the then Department of Humanities bldg. 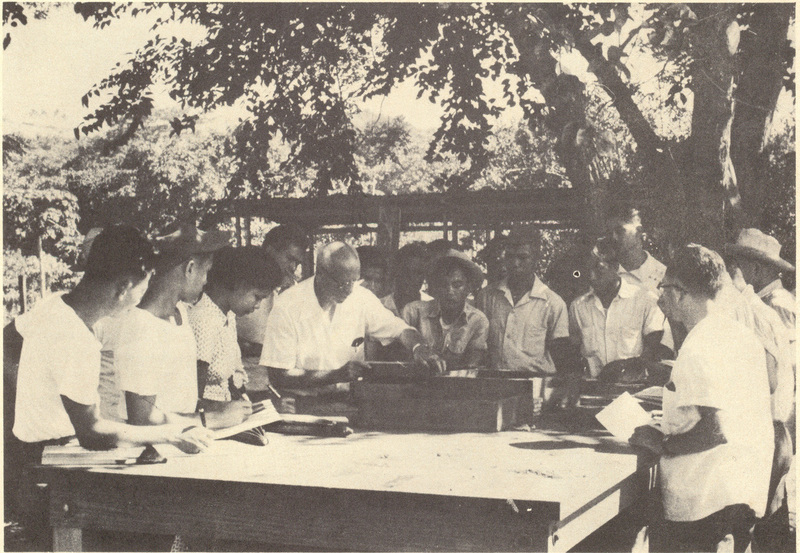 Professors and students of plant breeding used to work together out in the farm. Today, many faculty members are out on consultancy assignments, and students are scared of getting darker under the heat of the sun. Times, indeed, have changed. This was how the old building of the Department of Plant Pathology looked like prior to the Five Year Development Program of UPCA. What stands on this site today is the Abelardo G. Samonte Hall, what used to be the UPLB Administration Building but which has been returned to the Office of the Dean, College of Agriculture, during the term of Chancellor Luis Rey Vilasco. In those heady years at the UPCA, when there were very few female students (this scene is in the 50s), UPCA students invited female students from UP's Padre Faura Campus and other Manila-based universities (like PWU, PNC, among others) to be guests during Loyalty Day Balls. Quite a few of those kolehyalas from those universities and colleges in Manila eventually joined the UPCA faculty and married young UPCA faculty members. Los Banos was rich hunting ground for good looking, dependable husbands. Since the psycho-emotional make-up of the UPCA Loyalty Day changed in the late 60s, the Loyalty Day Ball ceased. Besides, there was rapid increase in the number female students in Los Banos beginning in the 60s, and there no longer was need to invite kolehyalas from Manila and suburbs. Female UPCA students were as pretty and active academically as their counterparts from Padre Faura. 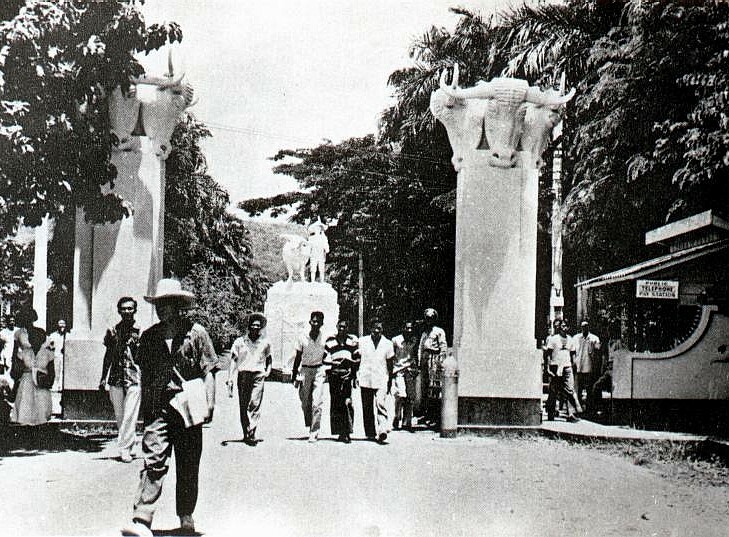 In the mid-1960's, during the implementation of the Five Year Development Program of UPCA, the carabao statues were moved back to where they now are. Moving those solid concrete statues and monuments wasn't easy, and it took quite sometime to get them where they now stand. This task lasted three months. Another common event on the UPCA campus in the 60s were the field days. This rice field day was attended by a large number of farmers from around the rice growing provinces, including students from other colleges of agriculture. As students, we always looked forward to these field days. In the late 1970's the old Agricultural Chemistry building was razed by fire. The facade of the AgChem Bldg was what was left. A new building is now standing on this same site. In the 1960's, too, the UPCA offered the BS Sugar Technology program. Students in this program had scholarships. In fact, we ordinary mortals at UPCA used to call this group, together with majors of agricultural chemistry, the elite group, an acknowledgment, I guess, that they were good, in chemistry. In future entries, we shall try to write about new programs and landmarks on the UPLB Campus as they appear today. Congratulations for becoming Professor Emeritus of Devcom. As I young pupil in Maquiling School, I think I remember that the Old AgChem also got burned down in the early 1990's (1991 I think)? I believe it took down with it one of the only two electron microscopes in the country back then. Am I correct? Thanks so much! Oh, by the way, why am I so interested in making this page the best? I have four reasons --- my father, Moises R. de Guzman, Jr., finished his BS, MS and PhD there, my eldest sister Celia de Guzman-Ogbonna finished her BS there. I finished my BS there, and my little sister, Inday (Bini de Guzman-Dizon to you) finished her BS and MS there. I think she's now taking her PhD there, I think, but I'm not sure. She teaches there, Associate Professor yata sa Department of Humanities. Mukhang naging College Secretary pa nga for a time.. She is also the head of some English language school for foreigners at The Department of Humanities.You won't miss her, trust me. She dresses like a model, moves like a model, chin up head high, hips swinging side to side. Most of all, she's a good, eloquent public speaker. She talks like a superstar. Istariray si Inday. But I still love her because she's my second favourite sister.